You Won't Forget Me, Will You, Tutu? One of Azerbaijan's greatest problems in transitioning to the new Latin alphabet has to do with the country's immense refugee population brought on by the conflict in Nagorno-Karabakh, a region in Western Azerbaijan. When Armenian military forces ransacked and pillaged towns and villages back in 1992 and 1993, Azerbaijani refugees by the hundreds of thousands fled for their lives, often on foot. Many gathered into makeshift camps set up near the sides of roads. Gradually, humanitarian organizations began providing emergency shelter in tents. Even today, tens of thousands of refugees still live in subhuman conditions in mud-brick shelters they built themselves, in empty boxcars along railway sidings and in what were previously dormitories and even unoccupied, unfinished buildings. Photo: Posting a letter to TUTU, the parrot. But one of the greatest tragedies of the war is that refugee children have not had the chance to receive a normal education. The decision to change alphabets has further exacerbated the situation. While many Azerbaijanis are quick to point a finger at the cash-strapped government for not providing more books, concerned individuals like Tarlan Gorchu are actually trying to do something to alleviate the situation. We talked with Tarlan about two main projects that he directs: publishing colorful children's books in the new Latin alphabet for young readers, and creating a penpal system with TUTU, an imaginary parrot, so that young refugee kids can connect to a world beyond refugee camps and believe in their future. Though the need is overwhelming, Tarlan and his team of volunteers have found ways to make an impact. But they need help. 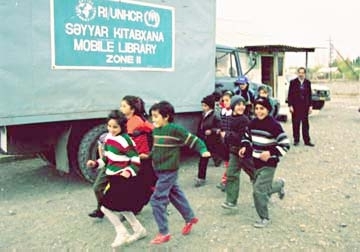 Photo: Refugee children running to meet the Mobile Library that makes its rounds to numerous refugee camps each week. This educational project is sponsored by the UNHCR and Relief International. Who receives the most letters in Azerbaijan? Without a doubt, it's TUTU, a friendly, bright-eyed, lovable yellow parrot - the brainchild of Tarlan Gorchu and a group of five volunteers who write to children in refugee camps. But why Tutu? "Well, he's a bird, not just an ordinary bird. He's a parrot and that means he likes to talk a lot, laugh a lot, repeat words a lot. He's colorful, curious and loved by everybody. Just like kids!" explains Tarlan. In a sense, writing TUTU is a bit like writing to Santa Claus, except that TUTU can't give kids the physical things they want or even need. Rather he tries to give them friendship, hope and a desire to become educated - which is a far greater gift. Whenever schoolchildren write letters to the imaginary parrot, he personally answers every single letter (via the assistance of volunteers, some of whom are actors in the Buta Children's Marionette Theater.) Tarlan's wife Heyran Badalova also carries much of the administrative load. 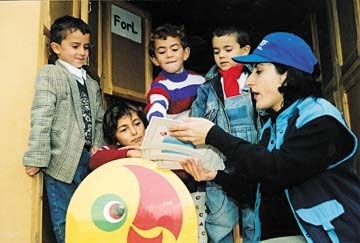 Photo: Distributing books from the Mobile Library. "You have to be very careful and attentive to the children's letters. You must put your heart and soul into each letter. We always try to calm them down, to give them hope," Tarlan explains. Kids write in Azeri Latin as they don't know Cyrillic at all. Sometimes when they see books in Azeri Cyrillic, they think it's in Russian. The TUTU team also writes back in Azeri Latin. As of April 2000, TUTU had received more than 1,150 letters from 700 different refugee kids since the project began in mid-November 1999. For many refugee kids, it's a new experience to receive mail, as letters from TUTU are the only ones they've ever received in their entire lives. This simple gesture transports kids beyond the limited world of their refugee camps­especially for the kids who were born in the camps and have no concept of life in the outside world. Photo: Choosing books, many of which are published by the TUTU Group. Some haven't even seen the towns and villages or the picturesque regions that their families fled from. Some have little idea of the trauma that their older brothers and sisters, parents and neighbors have lived through this past decade. The TUTU letter project began with initial funding from Unocal for a few computers, office supplies, stationery and envelopes. 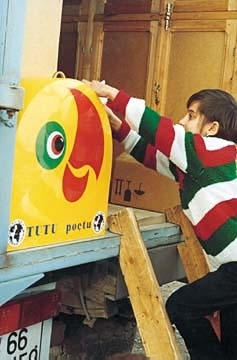 TUTU sends personalized typed letters back to the children in envelopes printed with the parrot's picture along with several sheets of yellow paper so they can write TUTU back again. The bright paper and envelopes provide great incentive for the children to use their best handwriting and to be neat. Currently, TUTU corresponds with children in seven refugee camps in the central regions of Azerbaijan: Yevlakh, Barda, Oghuz, Aghjabadi, Aghdam, Shaki and Tatar. Tarlan estimates that between 80-90 percent of the school children in these camps are writing to TUTU. They share with TUTU things that they often don't even share with members of their families. They often write TUTU their secrets. In each camp a bright yellow postbox has been set up so that kids can drop in their notes. They're then picked up by a Mobile Library sponsored by the UNHCR and Relief International, which makes its rounds through the camp every week. Once the letters are delivered to Baku, TUTU volunteers busy themselves answering the letters to be delivered when the mobile library returns to the location the following week. Like most children, refugee kids like to ask a lot of questions: "When will I be able to return home? When will I get to go to a normal school? I'd like to write to a girl pen pal with black hair and black eyes - can you help me? Could you send me a TV set?" One curious seventh-grade girl named Ragsana asked, "What was the last planet to be discovered?" It sent TUTU scrambling to discover that the answer was Pegastro, which had been discovered in 1995. "We don't want the kids to feel trapped in their camps," says Tarlan. "We want them to feel like they're personally communicating with the outside world. We want them to realize that someone actually believes in their future - that they haven't been forgotten." Kids are thrilled when they get letters back from TUTU. It's an important link to life beyond the camps, many of which barely have one central telephone to serve thousands of people, and in many cases no access to governmental mail service at all. Once, a first grader's letter was somehow misplaced on its way to the TUTU office. When the other children received letters back from TUTU the following week, the child was crushed. Eventually the letter was found and TUTU wrote back to calm the boy: "Sorry, but I received your letter late. I was traveling around in several countries, and your letter kept following me, trying to catch up with me. I finally received your letter in France. I don't know when you'll receive my letter but don't worry, I've received yours." The child was so happy and went around telling everybody that his letter had found TUTU in France. It built up a lot of confidence and hope among the kids in the camp. TUTU sometimes sends toys or books to encourage the kids to write, especially during holidays such as New Year's on January 1st and at Noruz (Spring Holiday) on March 21st. Toys are collected from kids at schools in Baku and distributed to the refugee children. "People try to help out with food and clothing for the refugees, but they often forget that the kids have no toys," says Tarlan. In April, a contest is being held to see who can write the funniest or most interesting story to TUTU. Every child who writes will receive a small present. The top ten winners will receive a full set of TUTU books and magazines. The TUTU (Parrot) Children's Cultural Center was founded three years ago in 1996. It is a non-governmental, non-political, non-religious, non-profit organization. It brings together concerned intellectuals - artists, actors, film directors, psychologists, journalists, philosophers, philologists and musicians - who are all committed to serving kids. "Five to six years ago, we were faced with the problem of not having books for children in Latin," says Tarlan. "We adopted a new alphabet, but we didn't have any books in this script. The need was especially critical in refugee camps. For the kids who have grown up only studying in Azeri Latin, there is no information source except for the books they study at school. But there are only a few textbooks - nothing else - and sometimes a single text has to be shared among dozens of children. We realized how critical the problem with Latin books was and decided to start a separate organization to deal with this problem." In the past three years, TUTU has published 35 books, in total about 300,000 copies. The books are distributed to refugee kids and children from poor families. One of TUTU's first titles was "Fairy Tales of the World's Peoples," a series of 16 books that contains German, Chinese, Eskimo, Swedish, Indian, Scottish, French, American, Azerbaijani and other fairy tales. Six of the volumes have been recorded on audiocassette, narrated by the famous Azerbaijani actor Rasim Balayev. The remainder of the series will be recorded soon. "Fairy Tales of the National Minorities of Azerbaijan" is a similar book series that features bilingual stories native to Azerbaijan, from Talish, Kurdish, Lesgin, Jewish and other traditions. This project is supported by the U.S. Embassy and international organizations such as the Norwegian Refugee Council, ISAR (U.S.) and Soros. The British and Norwegian Embassies have also been involved with some of the TUTU book projects, as has Oxfam and Save the Children humanitarian organization. TUTU's latest book, "Nature, Colors and Fairy Tales", 40 pages, just came off the press. It's a book related to the colors of nature - fauna and flora. Tarlan insists that every book published by TUTU is of highest quality. From the design to the text to the illustrations, every aspect is handled by talented writers and artists. To make sure the books are attractive to kids, Tarlan shows them to his two sons: Ujal, 4, and Basat, 2. "They may be too young to read," says Tarlan, "but I always take them TUTU magazines and books so that they can see the colorful illustrations. Observing them as they page through the books gives me good idea of what other kids are likely to be attracted to." TUTU's book publishing division has made considerable progress, but it can only do so much on its own. "We've managed to publish 35 children's soft cover books in three years," says Tarlan, "but this is nothing compared to the need that is out there. Tens of thousands of different books should be published in Azerbaijan every year." Tarlan accepts the fact that the Azerbaijani government does not have much money for book publishing. There are some state publishing organizations in Azerbaijan, but they have published only a few books. With this in mind, he says, the government should pay attention to the problem as well as help and encourage non-profit organizations as much as possible. "Kids are our future," Tarlan says. "One generation has already been educated in Azeri Latin, but they are like 'cripples' because they have only had school textbooks to read. It may be too late to give them a proper education. Thousands of kids are uneducated. Now another generation is coming. And yet our government doesn't treat this as a problem. I think it's a tragedy. "We Azerbaijanis must take care of our refugees, even more than foreign companies and foreign humanitarian organizations. This problem must tug more on our heartstrings. Maybe we don't have much money, but we're the ones who have to come up with creative ideas and solutions to help them."